"Heiress and celebrity Birdie Sederburg has been used to getting everything she wants. That is, until hot young actor Dean Stevenson (quite literally) crashes into her life. Birdie's convinced she's found The One. But Dean is only in it for his career, and is resisting her charm offensive. Still, Birdie is not prepared to admit defeat. 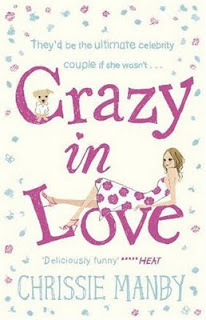 As her obsession with Dean grows, she realises she may have to do something drastic to make him fall in love with her. But is getting herself kidnapped in order to win his heart as insane as it sounds?How far would you go for love?" Information from Goodreads. I absolutely loved this book and finished it within a couple of days. I remember receiving this free with a magazine at least a year ago and adding it to my bookcase. It then didn't see the light of day for months until I needed a book to photograph my new bookmarks. From then on it has been staring at me begging to be read. I must say that I'm glad that I finally pick it up. Crazy in Love is about Birdie Sederburg who is the heiress to the Sederburg Golf Resorts fortune. She has everything that money could buy, but the one thing she is missing is a boyfriend (and manners it seems.) This is until one day when she crashes into her future boyfriend's car and falls 'madly' in love. From this moment on you can enjoy the story unfold as she faces many challenges to keep him by her side. I really love this book but I can see how many wouldn't. Birdie is your typical rich 'brat.' She has more money than sense and also believes that money can buy you anything. To some this would seem too much, but for me that was part of the charm. It was different to anything I've ever read, and though parts were predictable, it was not as predictable as others I've read which deserves a huge thumbs up! I now cannot wait to read more from Chrissie Manby. Crazy in Love deserves a huge 5 stars if not higher.